Undeterred by his previous failure to launch his ambitious project, a few years later, Henry Phillips proposed an even larger structure for a site further west, in Hove. This one had the confusingly similar name of the Anthaeum (“flower-house”). It was to be built of cast-iron and glass, and at 164 feet in diameter (36 feet more than the dome of St Peter’s in Rome), and 64 feet in height (81 feet to the top of the external cupola), it was boasted to be the largest domed structure anywhere in the world. The Anthaeum, unlike the Athenaeum, found backing: Sir Isaac Goldsmid, who owned the land, advanced the funds. Wilds was again architect. The foundations were dug out in 1832. The great iron ribs arrived at Shoreham to be hauled to site by teams of 20 horses. Glaziers began installing the 100,000 panes. Like Kubla Khan’s stately pleasure dome – that “miracle of rare device” – this fantastic edifice became a solid reality. But appearances hid major problems. Bishop claims one design fault was that it was not “the section of a perfect sphere, but an oblate sphere”. Others record that the contractor, a Mr. English, neglected to install a vital central pillar to support the structure, or that it was constructed, and then removed on English’s orders. 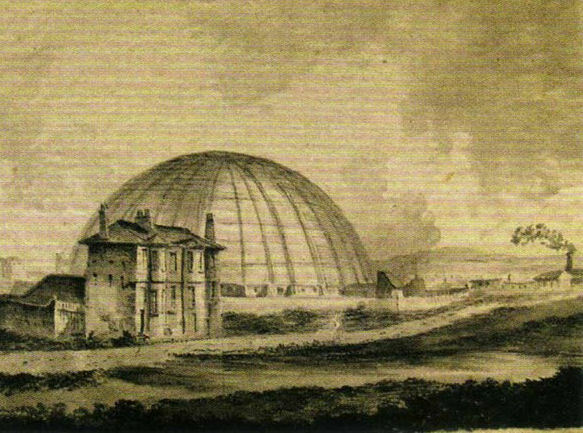 Little is known of Mr English, but it seems he was determined to make the Anthaeum the world’s largest unsupported dome. His pride was to prove fatal to the design.